Yesterday we got to visit Grandma and Grandpa down in Pleasant Grove. I mentioned the other day that they have a gorgeous yard that just begs for events like egg hunts! 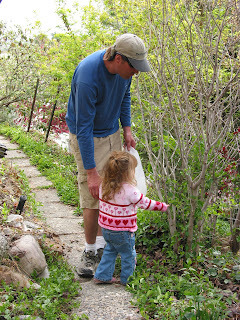 Grandpa (Bill) is a lanscape designer, and Grandma (Pat) enjoys working outside too, so it is something to be seen. Most of the cousins and siblings were in attendance, so it was pretty lively. 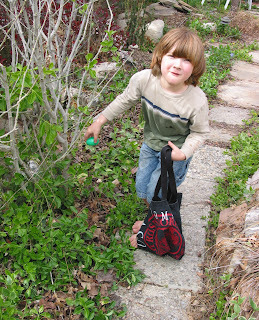 Every year they host an egghunt, with the littlest ones (us) getting a head start. Then after all of the eggs have been collected, there are prizes for the most eggs, and everyone chooses a number, then Grandma lays out the prizes on the table for everyone to choose their prize in turn. A couple of highlights were when Maddie, for her fist prize chose a hand-held electronic poker game for her prize, which her mother of course let her keep. Eric said "What difference does it make?" I have to agree with him. At worst, we'll put the batteries in and she'll push buttons and see the pictures and hear the beeps for a few months, then we'll put it away. I'm thinking to whom does it really matter how she plays with it, if she gets the same enjoyment out of it? 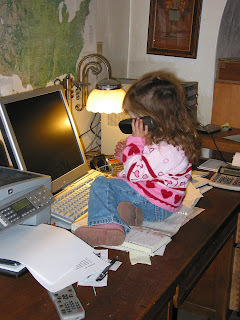 At another memorable moment Maddie was found by Grandpa in his office. She had climbed up onto his desk, had the telephone in her left hand, had managed (somehow) to make a few copies of something with the copy machine, and had at one point her right hand on the computer keyboard. Grandpa took it in stride, and I asked if she was going to work for Grandpa. 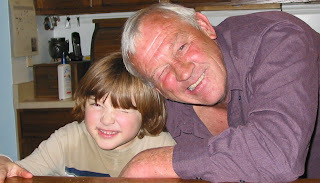 Here's a great shot of Trev and Grandpa. It's called "Wink! ", of course.